Gold D’Or™ is a proprietary Brand owned by Co-op Stores and as such is available pretty much Canada wide (although I am not sure if this is true elsewhere or not). Products sold under this brand tend to be a bit cheaper than equivalents under different labels and, for the most part, I have found them to be generally pretty good. I love make dumplings of all sorts but I thought it might be interesting to see how these ones put out by Co-op stack up against my own. 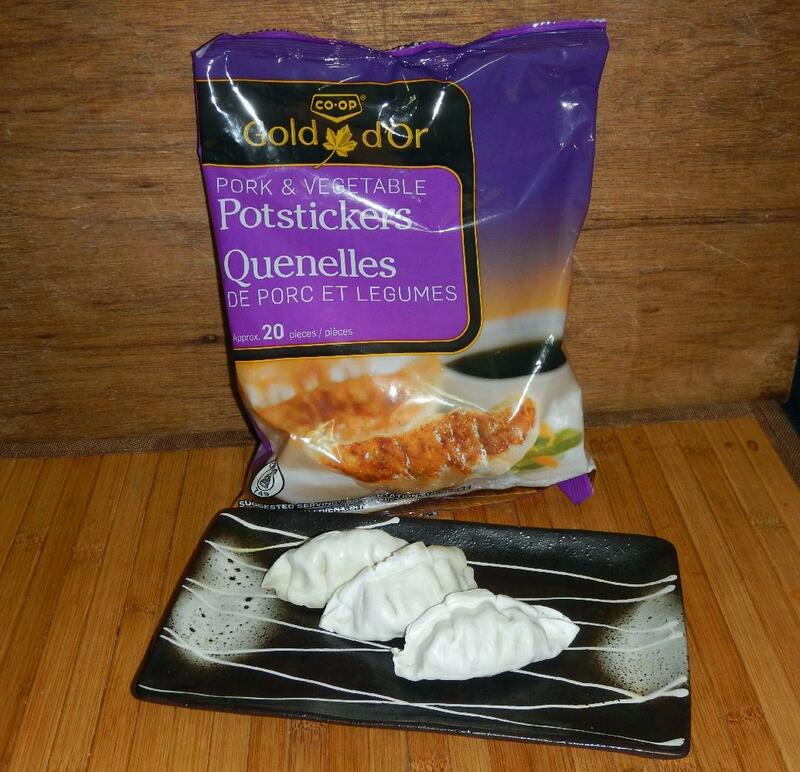 Although called ‘Potstickers’ on the package, this would only be true if you cook them by what is called the ‘Traditional Method’ in the instructions. They can, however, also be deep-fried, boiled or steamed, and are thus pretty much your typical Dim Sum offering known in Mandarin as Jiaozi. An examination of the ingredients listed on the ‘Pork and Vegetable’ package reveals that the sole vegetable is cabbage. This is actually a very common combo in Jiaozi and I rather think that Co-op chose to just say ‘Vegetable’ because it would sell better. The ‘Beef and Celery’ type does contain both these ingredients but also contains Cabbage as well. 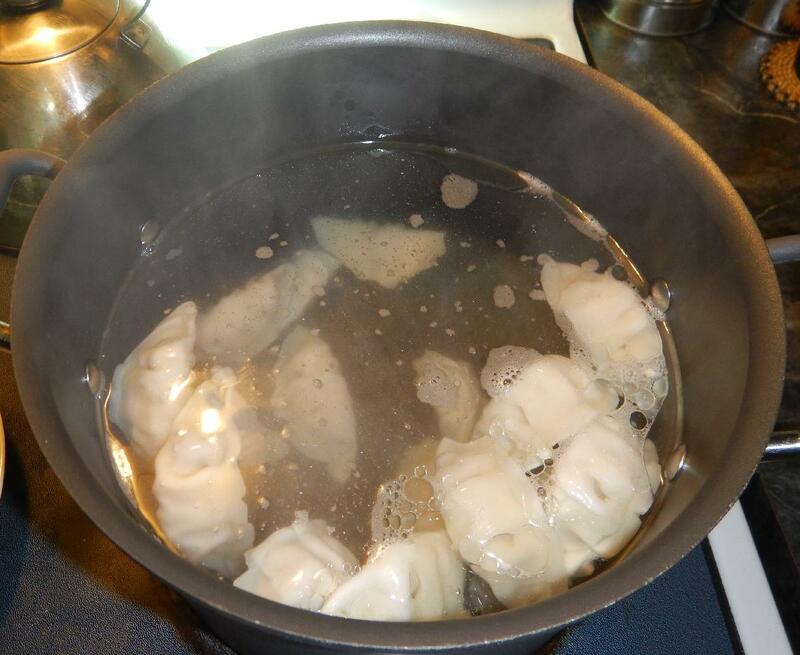 The instructions for boiling simply tell you to add the frozen dumplings to a big pot of boiling water and cook until they float to the surface. There is no mention of adding salt but I did this here as I usually do anyway. I also added a few tablespoons of oil as this helps to 0revent the dumplings from sticking together as they come to the top. The dumplings only took about 5 or 6 minutes to cook and I served the dumplings in a little chili oil. I didn’t jazz this up with anything else as I wanted to give a proper taste test without too much interference. I did, however, provide some bowls of soy on the side. I have to say that I was quite favorably impressed with the result. The wrappers were cooked perfectly and had a nice silky texture… not to soft and not too chewy. I forgot to take a picture of the inside but the filling was quite generous (as much as in any restaurant versions, if not my own home-made ones) and the texture was also excellent. There was actually only a little cabbage, just a few flecks really, and this was rather unexpected as I commercial dumplings often skimp on the meat in favor of ‘padding’. I actually wouldn’t have minded a bit more cabbage, myself but, overall, the mix was good and delicately seasoned. The instructions for the ‘Traditional Method’ tell you to heat some oil in a pan, add the dumplings ‘flat side down’ and pour in enough water to come ¼ way up the dumplings. You are to then cover the pan and cook for 5 minutes or so until the water has evaporated and then remove the cover, letting the dumplings continue to cook until brown and crispy on the bottom. This is basically the usual method and I followed the instructions almost to the letter. 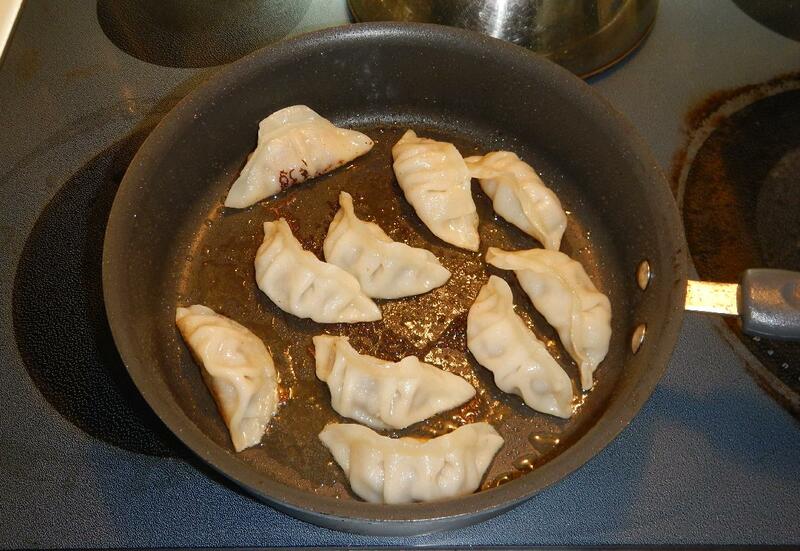 Usually, I brown my Potstickers a little before adding water but I didn’t on this occasion. I did, however, use a little less water than suggested as I rather think the instructions anticipate the pan bottom being more fully covered by dumplings. I had a lot of empty space (I only cooked 10) and I thought that water sufficient to come a quarter way up the sides of the dumplings would be a bit too much. 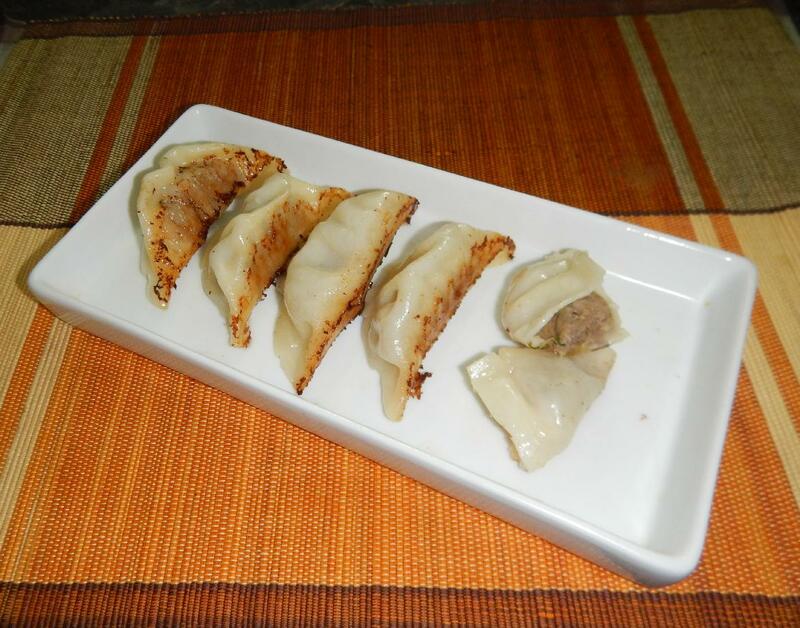 I tried the Beef and Celery dumplings for this test and overall they were very tasty. Again, there was more meat than vegetable, as you can see in the one I cut in two. I tend to use pork much more than beef in my dumplings but I think my next homemade batch will have beef along with other ingredients. The only thing I would add here is that I probably won’t use the traditional pot-sticker method for this brand of dumpling. 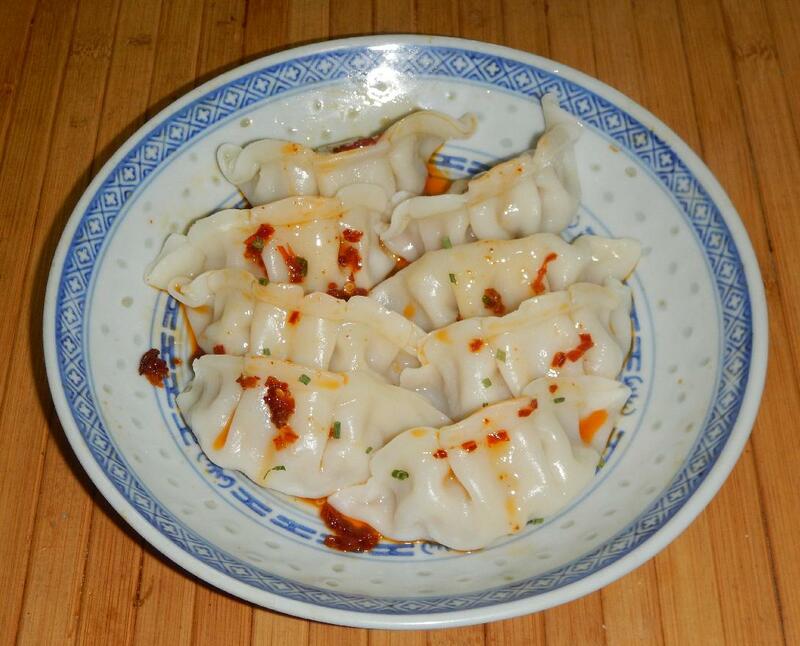 When I make pot-stickers I don’t usually use the pleated, three sided dumplings as here, rather I prefer a two sided dumpling and I brown on both sides. Thanks for the review, will look for them next time I go to Canada. Will also check out my local markets.